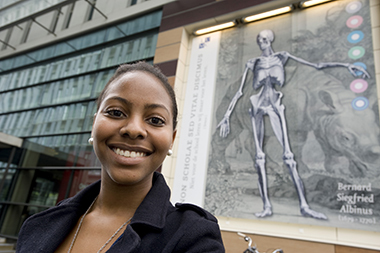 For more than 440 years, Leiden University has been at the forefront of medical science and education. Today, the Faculty of Medicine is hosted by Leiden University Medical Center (LUMC). We believe that good education is a joint responsibility of students and professors and highly value a critical scientific attitude and curiosity. We are convinced that enjoying your studies and student life is important for your personal, professional and scientific development. Are you looking for a study period abroad? A selection of courses is open to international students. LUMC is a modern university medical center for research, education and patient care. We have approximately 2.700 university students enrolled in the bachelor’s programs Medicine, Biomedical Sciences and Clinical Technology and the master’s programs Medicine, Biomedical Sciences and Vitality and Ageing. The teachers are doctors and scientists who work at LUMC. They provide students with real examples from their experience and insights from the latest developments in their field. A lot of education is small-scale, which means you discuss or work on a project in groups. Leiden University is a high ranking European research university. The university offers a wide range of bachelor’s and master’s programs, varying from humanities and law to science and medicine. The university is spread over historic and modern buildings throughout the cities of Leiden and The Hague. LUMC is located in Leiden, at the edge of the city center. The high number of students with different interests, the small scale of the city and the historic city center give Leiden a unique, relaxed and, at the same time, lively atmosphere. Do you want to know more about student life, housing or teaching methods used in Leiden? Visit the website for prospective students.